both the tassel and the agate pendant can be removed for a different look. Magnesite: Healing Stones. Magnesite aka Brucite Rock comes in white, gray, yellow, blue, brown; often marbled. Promotes positive attitude, relaxation and calmness. Blue Magnesite: Is a wonderful relaxing and calming stone to use in meditation. It promotes joy and emotional harmony, plus relief from stress. This beautiful onyx marquisite sterling silver cross hangs from a beautiful sterling silver chain interspersed with small onyx beads. moon’s energy, it has a gentle, cool, smoothing effect, thus reducing stress. Pink Opal: Is a stone of peace and tranquility for the aura. It is especially noted for its energies in healing emotions. Tiger’s Eye: (Red) Helps to gain insight, to concentrate, to perceive and think more clearly, and to organize scattered details. Calms turmoil, eliminates the “blues” and encourages optimism and enthusiasm for life. Stimulates wealth and enhances the ability to maintain wealth. Gold: (Plate) It brings vitality and solar energies into the body. It encourages optimism, courage, determination and an overall sense of well-being. It dispels fear and negative emotions. A wonderful creation encompassing pink opals which provokes dreams and tranquility, and rose quartz which is the “Stone of Love”. The perfect combination! This is just a delightful set ready to be enjoyed by all ages on all occasions. Rose Quartz: Known as the “Stone of Love”. Rose Quartz soothes, comforts and reassures, bringing about deep inner healing. Gently removes negativity and attracts the energy of love bringing peacefulness and calm to relationships. A dramatic sophisticated necklace choker for the discerning woman. The emerald cut 9.25 carat amethyst is a beautiful deep purple color and is set in a sterling silver hand-made bezel. The light contrast is lavender Jade – Jade the “fidelity stone” which is connected with love and virtue. An absolutely stunning creation! Amethyst: A “Stone of Change, Protection and Enlightenment”. It enhances spiritual awareness, meditation, visualization, serenity and composure. Amethyst attracts good luck and love, calms and transforms. It shifts energies to the higher frequencies of both the spiritual and ethereal levels. Be held by “Loving Hands”. The hamsa hand (Arabic) or hamesh hand (Hebrew) is an ancient Middle Eastern amulet symbolizing the Hand of God. It is said to provide magical protection from the envious or evil eye. It is believed to offer its owner happiness, peace, and prosperity. These earrings are silver plate and can be ordered in any Color Swarovski crystals. **We will repeat colors in these earrings. A delightful classic design using beautiful green malachite beads in two sizes and an elegant gold filled chain. Easy to wear and extremely versatile. This set includes a pair of earrings, the pull-over the head necklace and a stretch bracelet. loyalty in love, friendships and partnerships. Gold: (Filled) It brings vitality and solar energies into the body. It encourages optimism, courage, determination and an overall sense of well-being. It dispels fear and negative emotions. faceted stones – both showing a different element of the same gemstone and both displaying their own beauty. Imagine the necklace either on a deep color garment or on a lightly bonze tanned neckline – just stunning! 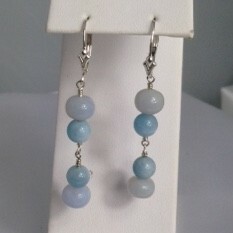 Chalcedony: Symbolizes calmness and composure; offers confidence. The pales stones are the chalcedony. This artist creation demands attention – it is unique in its make-up and makes a wonderful statement, while providing a sophisticated look. This necklace will be an ‘eye-catcher’ on all occasions! Pearl: Is known as the “Stone of Health”. It brings inner peace and represents innocence and purity. It enhances endurance and emotional stability and is said to benefit the lungs. From a distance these little gemstone beads look like a Monet painting of tiny dabs of “flowers” – this is a delightful creation full of love and fancy. 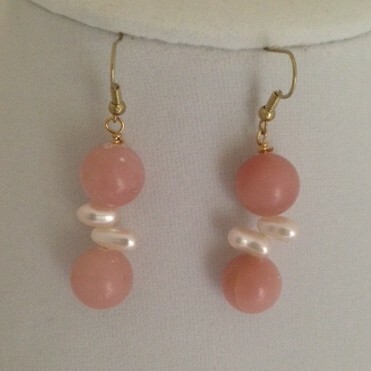 This set offers the buyer a choice of one of two pairs of earrings. This creation sparks images of dancing, music, laughter and friendship – of experiencing the joy of social interaction with the people who matter. A time to remember. Jasper: Is known as the “Supreme Nurturer”. Jasper reminds us why we are here – to assist others to free themselves from limiting bonds and bring joy and light into the world. It helps to balance and unite the energy of the physical with the spiritual toward the attainment of goals. It can be used when one’s energy is “low” and to provide protection against negativity. It is also known as the “Stone of Harmony”. Obsidian: Integrates mental balance; also assists in physical balance. Onyx: (black) Dispels grief; enhances self-control; stimulates wise decision making; repels negativity of others keeping oneself from harm; helps with rational thinking; overcomes loneliness, alienation, and adds comfort in unfamiliar surroundings. Black Agate: Relieves stress, gives protection and increases courage. This delightful set speaks of love and beauty – it speaks of the virtues of Venus, goddess of Love. The necklace is made up of Larimar, Amethyst, Aquamarine and Fresh Water Pearls. Larimar is only found in one area in the Dominican Republic – the island of Hispaniola, and the supply is limited. The pendant’s main stone is Larimar, as are the opaque blue stones in the rest of the necklace. Larimar: Builds confidence. It aids you to communicate with clarity, and it helps you speak of your emotions. It helps to dissolve emotional barriers and to release stored negative emotions such as angry thoughts, remembered pain and other detrimental emotions that are not benefiting you. This stone is known by various names including Atlantis stone, Dolphin stone and Stefilias stone. It will help you if you have problems managing anger, as it is cooling to the emotions. Larimar is known to help enhance creativity. “Summer Breeze” is absolutely perfect for any occasion! Its design is simple, clean lines and yet very modern. It offers the casual look with the turquoise nuggets and the classic finish with the round coral beads. This is a must for every well-dressed woman’s collection. Turquoise: Is an “anti-negativity stone” and general healer. It dispels negative energy and protects while it encourages self-realization and creative problem solving. Turquoise strengthens the body and energy filed – heals the spirit; and soothes and brings peace of mind. It is said to attract love. Coral: Facilitates intuition, imagination, and visualization and strengthens understanding of mysticism. It alleviates depression, quiets the emotions and brings peace. Coral strengthens the connection to the harmonious energies of the universe. 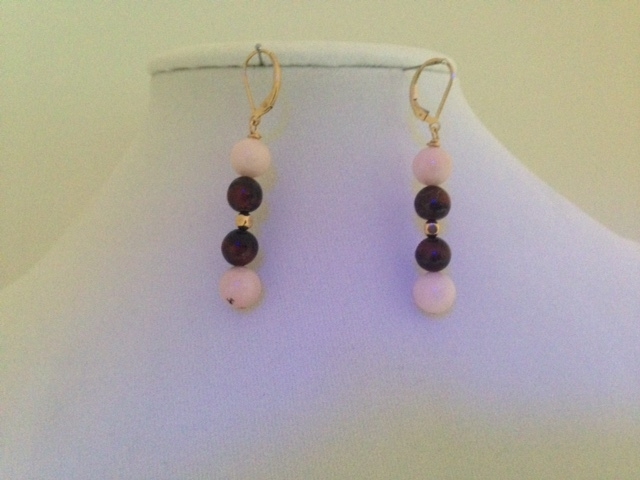 These jasper earrings are the beautiful color of a good burgundy wine and are unique in that they have natural fissures which provide character and depth to these stones. Black is beautiful!! This set is a wonderful combination of size, shape and texture. The wavy sterling silver spacers add a feeling of movement to this spectacular creation. This jewelry set could be worn day or night, casual or formal – regardless of the occasion, this accessory will enhance any outfit. Onyx: (Black) Dispels grief; enhances self-control and stimulates wise decision making. It repels negativity of others keeping oneself from harm. It also helps with rational thinking, overcomes loneliness, and alienation, and adds comfort in unfamiliar surroundings.